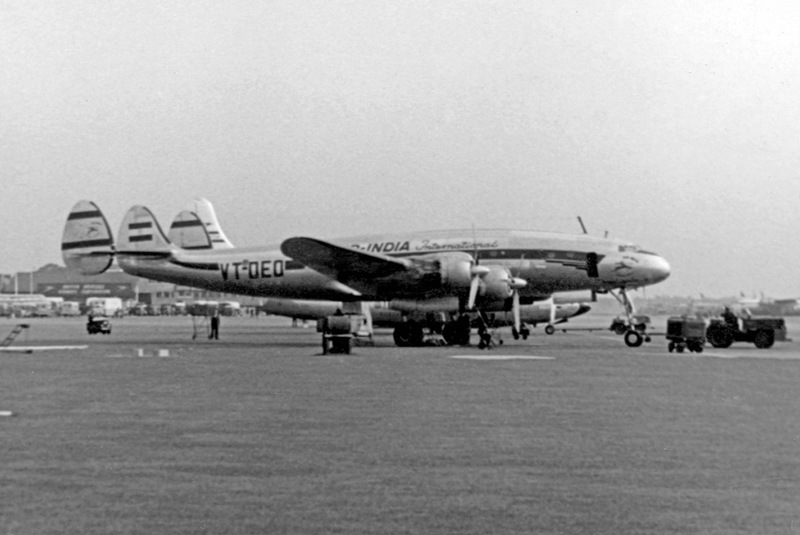 Today in aviation history, on the evening of April 11, 1955, precisely five hours into its flight to Jakarta, Indonesia, the chartered Air India Lockheed L-749 Constellation “Kashmir Princess” was suddenly rocked by an explosion. An instant later, the pilots saw flames streaming from behind the number three engine on the right wing. Smoke began to fill the cockpit. As the captain shut down and feathered the number three engine, he saw too that the fire warning light for the baggage compartment was illuminated. A fire in the cargo hold, a fire on the wing, and smoke in the cockpit were an extraordinary, life-threatening emergency. As the captain pointed the plane’s nose downward toward the sea, he hoped to ditch the plane into the water so that the survivors could escape in life rafts. A distress call was transmitted, declaring the airliner’s position over the Natuna Islands. Moments later, the radio went dead as the electrical system in the airplane began to fail, along with other critical systems as the fire spread below. Ultimately, the captain’s last hope of ditching the plane in the water was unsuccessful. 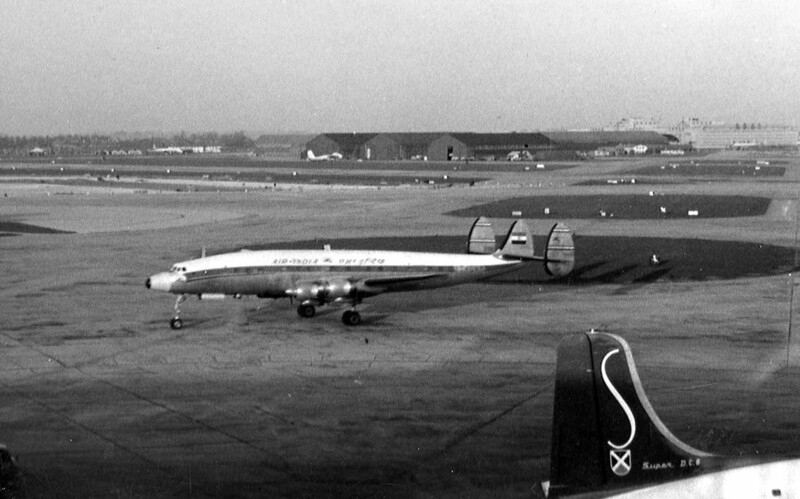 All of the passengers and some of the flight crew — sixteen in all — perished in the crash that followed. 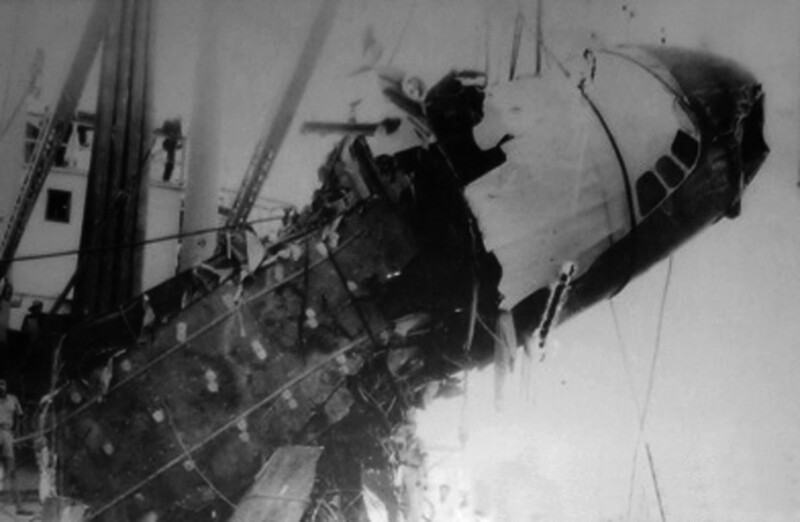 Somehow, three crewmen survived, including the first officer, the flight engineer and the navigator, who would later make clear statements of the events on board. What made this more than just another plane crash was one thing — China’s Premier, Zhou Enlai, was supposed to have been on board, though he had cancelled at the last moment after citing an emergency medical surgery need, but then three days later had proceeded to Jakarta via Rangoon instead. In the post-accident evaluation, investigators wondered whether the crash had been an accident after all — could it have been an assassination attempt gone wrong? They also asked themselves, why had Zhou Enlai cancelled his journey on that plane at the last minute but gone via another means? 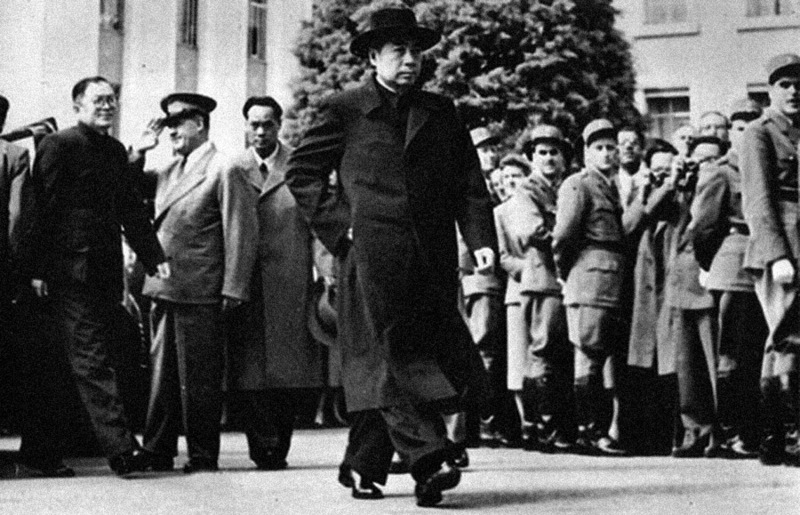 Chinese Premier Zhou Enlai walks forward (center) at a conference in Geneva, Switzerland, on April 26, 1954. As the investigation proceeded in the months after the crash, a number of strange coincidences and unexpected twists began to emerge. The full evaluation of the events determined that an explosion had taken place in the plane’s wheel well. That, in turn, had ignited fires in the baggage compartment and on the right wing. The most obvious explanation was a bomb mixed in with the passenger bags. Yet the passengers themselves were all officials and journalists heading to a conference — three were Chinese government officials, three were Chinese journalists and the rest were a mix of Vietnamese and East European delegates. All were heading to the Asia-Afro Bandung Conference in Jakarta, Indonesia, flying on an Air India flight that the Chinese government had chartered for the conference. 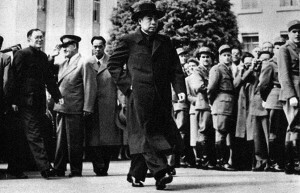 Three days later, Zhou Enlai arrived at the conference, apparently having never undergone any emergency surgery at all. To the investigators, it made no sense for one of them to have brought a bomb on board in a suicidal bid to down the plane. The fact that originally Zhou Enlai was supposed to have been on board was strong circumstantial evidence pointing to an assassination attempt, but by whom? Interviews were conducted with all of the ground crew, fuel truck staff and baggage handlers who might have had access to the plane at its points of origin as well as in Hong Kong, where the flight had made a stop en route to Jakarta. All of the personnel checked out and were proven to be innocent, except for one Hong Kong janitor working for an airport contractor. Quite simply, the man who investigators had originally identified as the lowly janitor, Chow Tse-Ming, was missing. Was it coincidence or could he have been the bomber? 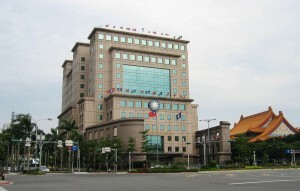 Former Kuomintang headquarters in Zhongzheng District, Taipei. As investigators and police chased leads about Chow Tse-Ming, they began to unravel a mystery. Apparently, Chow Tse-Ming was an alias; in fact, two other aliases for the same man were also uncovered. As well, in the days leading up to the bombing and crash of the plane, they learned that Chow Tse-Ming had been spending a lot of money around Hong Kong, as if living it up based on income or savings that an airport janitor shouldn’t reasonably have. Perhaps he had been paid to plant the bomb? Finally, his disappearance from Hong Kong was finally traced to him having departed quietly on a Civil Air Transport (CAT) flight to Taiwan. As the Chinese knew all too well, CAT was a frequent CIA contract air carrier, though it also flew other airline operations and cargo flights around the region. Fingers began pointing at the Central Intelligence Agency as the possible culprit, though a competing theory soon emerged when others considered that the CAT flight had delivered Chow Tse-Ming to Taiwan. Indonesian investigators reported that amidst the wreckage, they had identified an American-made MK-7 detonator device, adding fuel to the fire. The British-run Hong Kong police surmised that it seemed likely that the man was an agent of the Kuomintang’s intelligence operations arm, a theory which the Chinese also felt had validity — undoubtedly, the CIA had supplied MK-7 triggers to Taiwan. 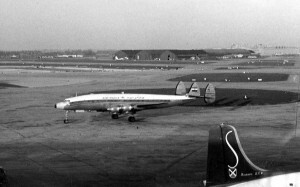 Despite the evidence that the events were of Taiwanese origin, in the years that followed, the Chinese asked the Nixon White House twice about the events of the plane’s bombing and whether the CIA had been involved, expecting that perhaps the attempt had been a joint CIA-KMT operation. In response to the second request, Henry Kissinger quietly noted that the Chinese thought far too highly of the CIA’s actual abilities. 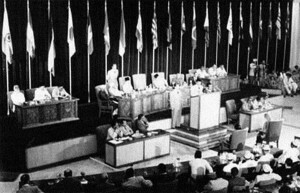 Ultimately, the evidence was compelling but not conclusive that the Kuomintang Government of Taiwan had attempted to assassinate the Chinese Premier, Zhou Enlai, and had failed, killing 16 innocent people in the process. The Bandung Conference in Jakarta during 1955, which was viewed by the West as a gathering of communist and socialist states. Years after the bombing, the Chinese government released a series of documents that painted a very different picture of the events of April 11, 1955, when the Kashmir Princess crashed. In the documents, it was learned that Zhou Enlai had been tipped off about the upcoming bombing of the Kashmir Princess. Rather than cancel the flight and lodge a protest, he had assigned lower level Chinese cadre officials onto the airplane as well as a set of journalists (as their presence would result in a wider array of press coverage). Knowing that all of those going onto the plane would surely die, he simply let the events happen, hoping to gain political advantage as well as cover for a secret trip to Rangoon for a meeting with the government there. Three days later, he would emerge in Jakarta for the conference, riding a wave of positive press coverage in the wake of an attempted assassination that had gone wrong and killed innocent people. The plan worked, though not as well as Zhou Enlai might have hoped — the investigation into the crash took far longer than a few days and ultimately, the culprits were never firmly established. Capt. D. K. Jatar, who lost his life in the bombing of the Air India plane, “Kashmir Princess” in 1955. The bombing of the Kashmir Princess is a sad tale, in which 16 innocent people died needlessly, pawns in a larger political game to which they played little or no part. The captain of the Air India plane, Capt. 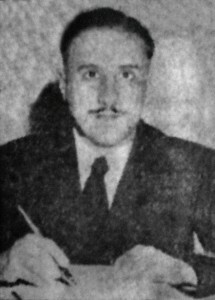 D. K. Jatar, as well as his flight crew members, M.C. Dixit and Anant Karnik, were professionals who didn’t deserve to be caught up in espionage operations and failed assassination attempts. That Taiwan attempted the assassination of Zhou Enlai is both despicable but also understandable in those times of Cold War intrigue and conflict. That China knew in advance and did nothing to prevent the bombing is equally immoral and, against virtually any ethical yardstick, is virtually indefensible. Looking back, we can only be glad that the dark days of the Cold War have ended, even if the question of Taiwan’s future remains open. Such deeds in a cloak and dagger world of “wet work” — the parlance of Cold War assassins — are hallmarks of a time long past, even if politically-motivated assassinations have continued even up to this day. More recently, the news has reported the allegedly Russian sponsored radioactive poisoning of Alexander Litvinenko in London and the 2004 poisoning of Viktor Yushchenko, as well as targeted assassinations undertaken by Israel’s Mossad in Dubai of the Hamas senior official, Mahmoud Al-Mabhouh, among others. Thankfully, however, none of those have involved the bombing of airliners. The world, it would seem, has come a long way since the early days of the Cold War. Italy’s Darkest Night — read about what might have been a French-attempted assassination of Muammar Qaddafi, which ended up shooting down an airliner over the Mediterranean. My father, Anant Karnik, was one of three survivors of this event. He turns 90 this year. He still suffers nightmares at times of swimming in an ocean surrounded by burning wreckage an flames that he felt were over 50 ft high. Holy moly…I can only imagine what it must have been like for him to go through that ordeal. Salute to your father and other two brave-hearts (Capt. Dikshit and J. S. Pathak). The sea was notorious for sharks! I am writing this thriller incidence, at full length, along with pictures, illustrations and maps, in my magazine named “SAFARI”. I could not find a single photo of your father (A S Karnik). I request you to provide me one so that I can print it. That article sound really interesting and I would love to know more about these people and their bravery. Could you post a link to that article? Would love to read it. My cousin, Gloria Berry, was the air hostess on this flight. She was awarded the Ashok Chakra for bravery. There is a very good book about the tragic crash of the “Kashmir Princess” that was written by Colonel AK Mitra. He was Military, Naval and Air Attaché in the Indian Embassy at Jakarta. His book tells a lot of the story and background to the events. It was tragic that so many died, including the Captain, and the 23 year old flight attendent, Gloria Berry, who died. She was soon to be married. I would like a photo of her as I am writing a book about brave cabin crew members. If anyone can help, please contact me. I am an author of the upcoming. My uncle Joe Pimenta was one of the pursers on that flight. Great guy from what I hear. I read your father’s book when I grew up and it so well described the flight and the aftermath. Brave man, your Dad. Firstly all my love and affection goes out to your father. A real hero, we don’t see many of them these days. I read that your father had written a book about his ordeal. Do you know where I could get it? Please post the link here! It is utterly despicable to try to also blame China for the death of the passengers and crew of the Kashmir Princess. The CIA and its Kuomintang partners, who had been blatantly flying their U2 spy planes at very regular intervals over every part of China those days with total disregard to the sovereignty of other countries, would most certainly have knowledge of the mid-air explosion in 1955. How could the Chinese authorities have any foreknowledge of such a wicked act of terrorism to sabotage the Kashmir Princess, especially when China had just established the Peoples‘ Republic just a few year ago in 1949. It had neither the resources nor the man power to be able to do much surveillance in territories not under their control. Whatever reports and stories that emerged later from the Chinese press were merely unofficial speculations. 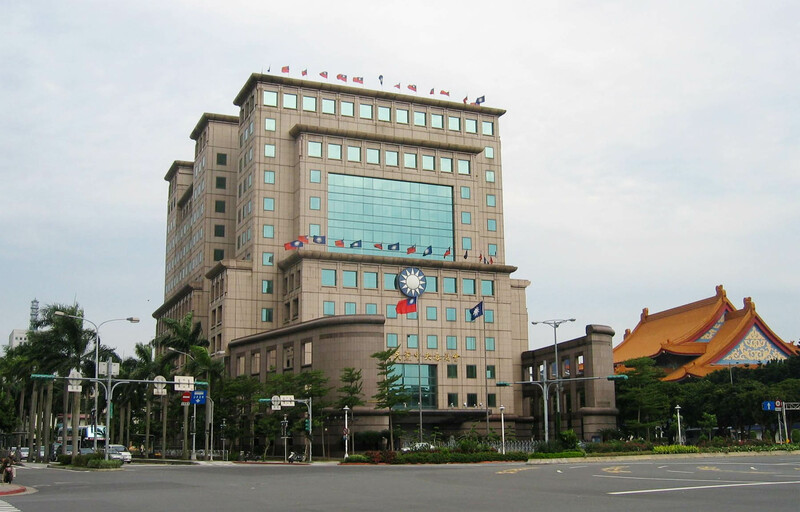 However, revelation by certain scholars and some of the CIA operatives many years later did point the fingers at the KMT Secret Services, with covert cooperation with the CIA. Your article has also failed to mention that the Chinese premier had made appointment to consult Nehru, the Indian PM and U Nhu, the Burmese leader in Rangoon before attending the Bandung Conference. That Rangoon rendezvous with the other two regional leaders had saved Mr. Zhou Enlai from being liquidated by the enemies of China. I salute to those heroes for their victory. I read about the incident in Safari magazine.